The movie release of the popular book of the same title, Divergent, has now hit the “big screen”. While we confess to knowing little about the storyline of the book and movie, we suspect it is safe to say that it is not about the contemporary investment environment. Yet, the term divergent strikes us as both a timely and apt description of the current investment and economic scene. Major economic trends continue to diverge from the patterns established over the past 10-15 years. For much of this period, emerging market economies, particularly the so-called BRIC nations of Brazil, Russia, India and China, drove global growth. Now these economies are saddled with growth-smothering excesses that accumulated in the boom years. To varying degrees, the economic troubles in these countries will likely require a considerable amount of time to remedy. In contrast, with few signs of similar excesses that are a threat to the domestic economic expansion, the U.S. looks set to become (once again) an economic growth leader. Slower and less commodity intensive growth in China may well mean the “commodity super-cycle” is over. Rising and volatile commodity prices lifted the fortunes of most commodity exporting countries, while triggering commodity inflation for developed nations’ economies. Commodity price relief as it unfolds will be very beneficial to U.S. consumers, producers, and the valuation of U.S.-traded stocks. The Federal Reserve (i.e. the Fed) is signaling they are about to diverge from the zero interest rate policy that has been in effect since the 2008 Financial Panic. Improving fundamentals underlying the U.S. economy have increased confidence that extraordinary monetary policy actions are no longer appropriate. The Fed policy shift represents a significant divergence from the policy actions of many of their global counterparts. The European Central Bank looks poised to join Japan in pursuing still more extraordinary monetary policy actions in hopes of keeping deflationary pressures at bay. Meanwhile, a different constellation of issues—inflation along with bad debt, over-capacity, and commodity excesses–are forcing many emerging market economies towards more restrictive credit policies. Manufacturing long has been considered a sore spot within the U.S. economy. We believe evidence continues to mount that a productivity-driven manufacturing renaissance is occurring. Some analysts are even making the claim that investors’ new “emerging market” may well become that area of the U.S. often derided as the “rust belt”—middle America! The trade deficit—as measured by economic statistics—has been a persistent drag on U.S. economic growth. Here, too, indications suggest trends are set to diverge from the long-run pattern. U.S. based manufacturers are at the forefront of adopting new technologies that are remodeling both the production and nature of an increasing number of goods and services. The domestic energy revolution continues to blossom as well. Trade no longer may be a drag on domestic growth measures. BMW said it will spend $1 billion to boost production at its South Carolina assembly plant by 50 percent in the next two years. One more sign that the United States has become a competitive site for manufacturing and an attractive staging ground for exports. A common forecasting technique we humans use to deal with uncertainty is to simply extrapolate the recent past into the future. And, while this technique often works well, when trends diverge from past patterns, investment expectations and risk/reward profiles of investments shift—often dramatically. We suspect the economy and financial markets are in the midst of one of these periods. And, while some of the divergent trends have already been underway for a while, it is still “early innings” investment-wise, as we now discuss. 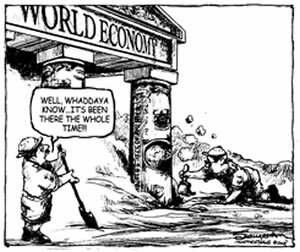 The slow pace of the economic expansion is not news, of course. The fixation on the pace of growth is understandable, but overlooked has been an important attribute about the character of growth. One of the underlying “drivers” behind these divergent growth trends is technology-induced productivity gains. Technology has enabled an unprecedented ability to share information and “idea recipes” for innovation. Virtually any problem is now open to the free market of creative minds across most of the world’s population. China has 95 Empire State Buildings worth of empty office space. Innovation is the oxygen which productivity growth needs to “breathe”. And, productivity gains are, in turn, the raw ingredients for a rising standard of living via both rising wages and the increasing affordability of goods and services. As a result, productivity-inspired growth is high-quality, resilient growth. This stands in contrast to growth fueled by unsustainable borrowing-to-consume behavior such as that which defined the prior U.S. economic expansion, or borrowing-to-build excessive capacity as now appears to afflict China (see quote above). Since the current economic expansion began, there have been threats to growth from geopolitical developments, economic troubles abroad, and economic intrusions from Washington D.C. Throughout, the underlying growth trend has proved resilient. There will, no doubt, be more unpleasant bumps in the road ahead, and the implications of each will have to be assessed along the way. But, the resilient character of the underlying growth dynamics suggest the duration of the expansion from this point forward will still likely be measured in years rather than days or weeks. From an investment perspective, an important question to keep in mind is: how is reality unfolding relative to expectations? Investor sentiment tends to rise, along with stock valuations, when reality consistently exceeds expectations. The stage still remains set for “better than expected” outcomes in the U.S. economy. With the rise of the perceived “emerging markets century”—to borrow a bold book title published during the emerging markets boom, the view that “our best days are behind us” has been a common U.S. economic sentiment. The Financial Panic only reinforced the view about domestic prospects. This downbeat and fragile state of the general psyche still persists. Five years into the economic expansion, a recent NBC News/Wall Street Journal poll indicates that nearly 60% of polled adults believe the U.S. economy is still in recession. Most analysts believe that the Chinese economy will once again expand by more than 7 percent this year, despite ballooning private sector debts. But the pessimistic minority has history on its side. Only five developing countries have had a credit boom nearly as big as China’s. All of them went on to suffer a major economic slowdown. Five years ago it took just over $1 of debt to generate $1 of economic growth in China. In 2013 it took nearly $4 – and one-third of the new debt now goes to pay off old debt. Nor is such sentiment confined to the general public. 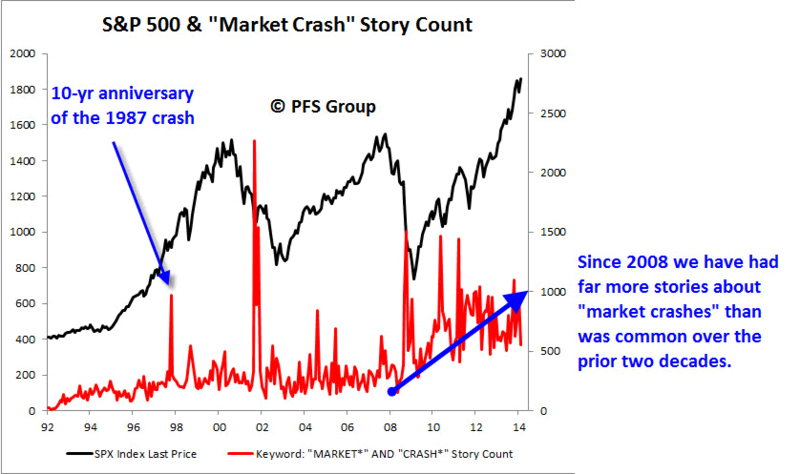 Market “bubbles” are being fretted almost constantly as Chart 1 suggests. Chart 1: Investors are alarmed by both good (new highs in stock prices) and bad news. While the level of fear, uncertainty, and doubt we have noted over the past few years has lessened a bit, and general valuations of U.S.-traded stocks have risen, expectations about the future of the economy remain modest at best. Against a backdrop of low U.S. expectations, the divergent trends still have a rather “low bar” to clear to deliver favorable surprises and trigger more improvements in general investor sentiment. Stock valuations are also likely to get a boost from additional factors, as well. The normalization of interest rates and a narrowing trade deficit will likely help fuel a rise in the exchange value of the dollar. A rising dollar, along with productivity growth and commodity price relief, provides a favorable backdrop for corporate earnings growth, profit margin durability, and the overall valuation of U.S.-traded stocks. 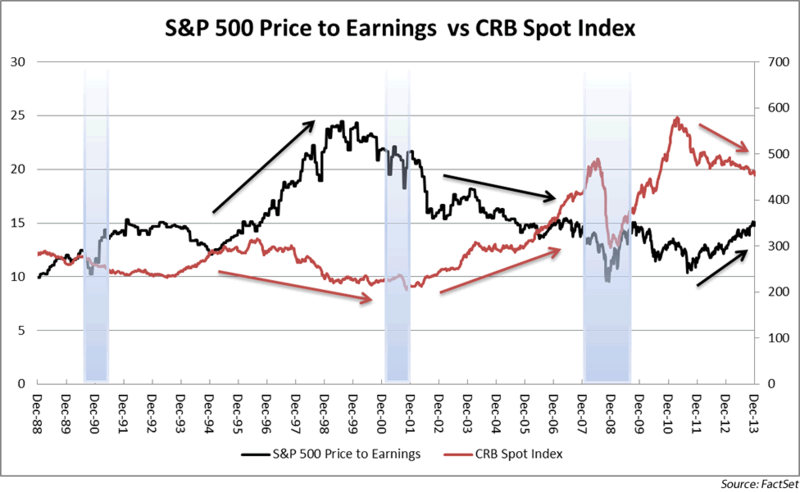 Chart 2 reflects the interplay we have noted on prior occasions between stock valuations (P/Es or price-to-earnings multiples) and commodity inflation. While commodity price inflation compressed P/Es of U.S.-traded stocks last decade, we expect commodity price relief will provide a tailwind behind general stock valuations in the period ahead. So far, most price relief has occurred in non-energy related industrial commodities. An unusually cold and snowy winter across much of the U.S. has boosted prices of natural gas and many agriculture products. Mean-while, although oil price volatility is down substantially from prior years, geopolitical issues have kept oil prices firm. More seasonal weather should help take the edge off heating costs and the price of ag products. 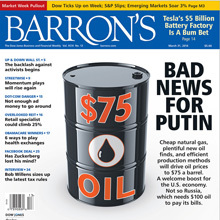 Oil price relief may also be on the horizon as the Barron’s magazine cover story suggest. We believe favorable risk/reward investment profiles exist in many firms that are providing the modern-day “tools” that enhance productivity growth. Such tools may include sophisticated measurement instruments, product design software, big data, and cloud-based applications, as well as direct digital manufacturing and 3-D printers. Opportunities to benefit from the manufacturing renaissance also may be found in select construction/engineering and transportation businesses. In addition, lenders that provide the financing that enable manufacturers to buy the new tools and fund necessary capital expansion plans stand to benefit as well. Lastly, opportunities also exist in select growth businesses that are driving transformative changes in selective niches in the retail, healthcare, and technology markets. In the material that follows, we offer a bit of perspective on some of the investment worries of the day. Not all companies stand to benefit from commodity price relief and stronger dollar trends. Unless they have sufficient unit volume growth, the earnings of commodity producers and their suppliers will likely be hard pressed to overcome falling product prices. And for those companies whose growth engine relied upon global commodity expansion, earnings disappointments may occur as weaker international end markets and unfavorable exchange translation take a toll. The new divergent trends are creating a different set of investment “winners”. What “worked” well investment-wise last decade, may no longer be so rewarding. What happens when the “sugar-high” ends? Two potential risks revolve around the Fed’s movement towards normalizing monetary policy. One risk concerns the view that the economy and market are only being held up by the Fed’s extraordinary actions. Absent the Fed induced sugar-high of additional asset purchases, bad times are ahead, according to this view. Table 1 is offered as “proof” of this thesis. Since the Financial Panic of 2008, stock price advances all have occurred during episodes of Fed bond buying programs. When prior Fed bond buying programs concluded (identified as QE1 and QE2 in the table), stocks prices suffered sizable declines. Table 1: Fed induced sugar-high? While the risk of a stock market setback is always present, we are not in the sugar-high camp. The resiliency argument offered earlier partially shapes our more favorable expectations, but other important factors contribute as well. The Fed of the 1930s allowed the financial system to collapse and trigger the Great Depression. The modern-day Fed learned from that disaster and fulfilled a “lender of last resort” role in the aftermath of the Financial Panic of 2008. Their liquidity-providing actions and the associated expansion of the Fed’s own balance sheet filled a hole that developed within the financial system as private sector credit demands staged a sharp decline. But unlike the prior two periods when the Fed ended extraordinary bond buying programs (highlighted in red in Table 1), private credit demands are now rising. Chart 3 below reflects this development. 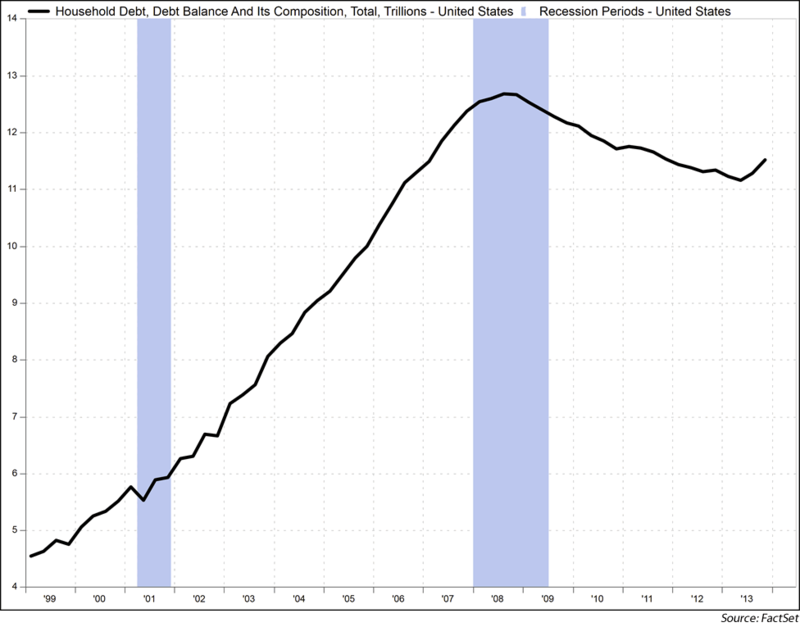 Incidentally, this chart and additional analysis are provided in a recent Market Commentary entitled, “Household Deleveraging Ending”. With no hole left to fill, it is both appropriate and timely for the Fed to wind down its lender of last resort activities. The economy no longer requires extraordinary support. The stock market’s relative resilience since the Fed announced the tapering of its latest bond buying endeavors in December (last line in Table 1), suggests “this time is indeed different”. The second risk associated with the Fed diverging from its long-standing zero interest rate policy relates to the normalization of interest rates. Can the economy withstand higher interest rates? With credit conditions gradually moving towards something resembling normalcy, we believe probabilities are very much on the economy’s side. It is also important not to confuse the Fed’s current policy shift with the type of “tight” money policies that typically render an expansion vulnerable to recession. The Fed is likely a long way from tight policy of that magnitude and will remain so as long as inflation remains modest. History indicates the stock market handles rising interest rates reasonably well as long as the change in rates signals growing confidence in the prospects for corporate earnings and the economy. The investment implications for the bond market are less sanguine, however. The rise in bond yields that has transpired over the past year has helped improve the risk/reward profile of bonds in general. However, Treasury securities across the maturity spectrum remain priced with little cushion to withstand the higher yields the normalization process will likely bring. By the way, many municipal bonds (which experienced stiff price declines last year in the wake of the Detroit bankruptcy and the fear that Puerto Rico will suffer a similar fate), and our remaining preferred stock investments possess much more favorable risk/return profiles than most of the bond market in our assessment. Generally unattractive bond market prospects beg the question, why own bonds? The answer is two dimensional. First, low interest rate/risk exposure via short-term bonds, floating rate securities and the select munis, and preferred stocks we own in varying amounts should weather the yield normalization process relatively well. In addition, significant liquidity provides ample dry powder for bond purchases when the risk/reward profile of the bond market improves. Secondly, despite low yields, bonds continue to fulfill their portfolio role within blended bond/stock portfolios by dampening stock volatility when it is needed most. To show this point, we reproduce Table 1 below, but have added a column that provides bond returns during those periods when stock prices suffered downturns. As the data reflect, even with low yields, bonds provided returns that cushioned the sting of stock market setbacks. Aging populations represent a potential issue for many nations. 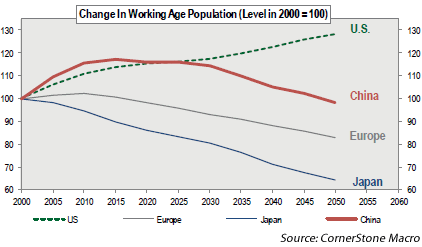 From an economic growth perspective, the situation could become particularly acute in countries where either the working age population is at risk of being dwarfed by the retired, or outright population declines may occur. Europe and China face the first headwind while Japan is potentially threatened by both conditions (see following chart). Historically, the age groups currently occupied by “GenXers” and the “Millennials” have been characterized by starting the greatest number of new businesses as well as purchasing the greatest number of homes, autos, and household furnishings. We suspect these same tendencies will be displayed with those currently in these age groups. Lots of pent up demand already exists as the next charts suggest. 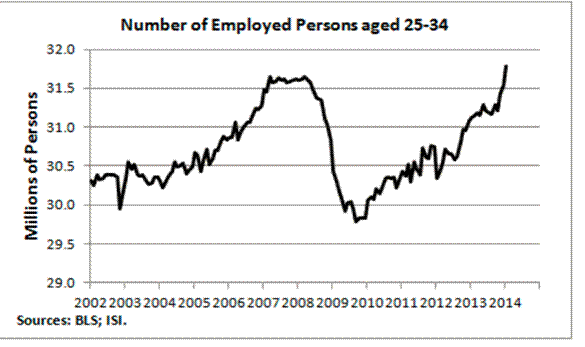 For those worried that the younger cohorts will not be able to find jobs, we note that employment in the 25-34-year-old group now exceeds its pre-Panic peak and is headed in the right direction. The conventional wisdom appears to be that the vast majority of student loan borrowers are being crushed because their loans are so large. The reality is quite different. Only 3.7% of those with student loans have balances in excess of $100,000. A very sizeable minority (39.9%) have student loan balances that are less than $10,000. As a result, the figure for the average student loan that is quoted in the press is very misleading. According to calculations done by the Federal Reserve Bank of Kansas City, the median student loan debt in the first quarter of 2012 was $13,662 while the average debt was $24,218! The vast difference between the average and the median reflects the impact of a very small percentage of borrowers who have very high debt levels. 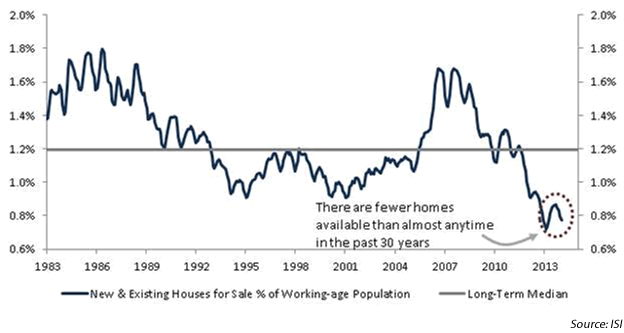 ISI offers other information (see housing chart below) as some food for thought for those worried the housing recovery is over. ”“During the last 100 years, there have been more 10% market pullbacks than Christmases. Everyone knows Christmas will come: think of volatility the same way. It is not likely that business cycle dynamics have been, or ever will be, repealed. There is no doubt in our minds that the current business expansion will end at some point as will the current stock market advance. It is also likely that before then some current worries will indeed become big issues and financial market volatility will occur. Business cycles end when the combination of tight money policies of the Federal Reserve and accumulated excesses of debt, inflation, product inventories, and over-optimism render an upswing brittle. We are a long way from such conditions. In the meantime, investment opportunities beckon from the changes unfolding from new and divergent business trends.